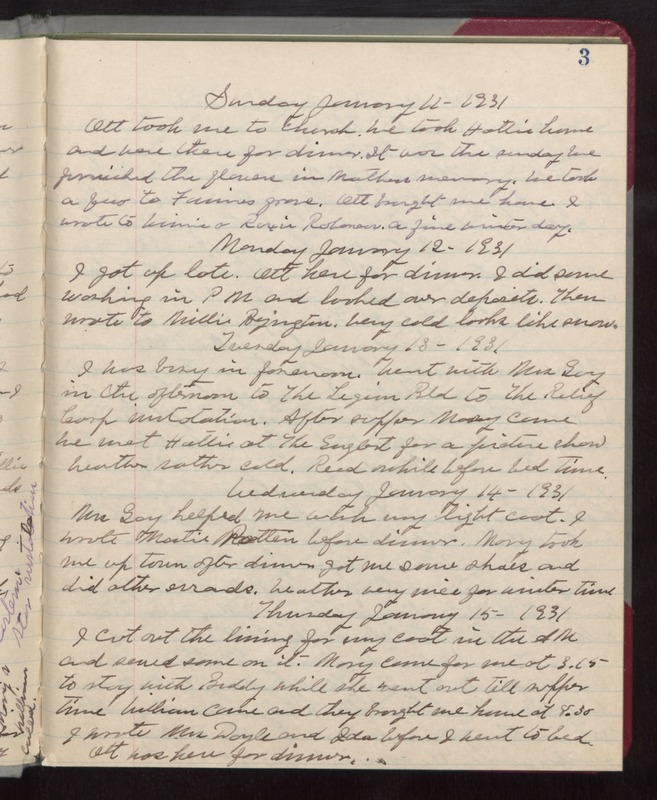 Sunday January 11- 1931 Ott took me to church. We took Hattie home and were there for dinner. It was the sunday we finished the flowers in Mothers memory. We took a few to Fannies grave. Ott brought me home. I wrote to Winnie & Roxie [Robaneov]. A fine winter day. Monday January 12- 1931 I got up late. Ott here for dinner. I did some washing in PM and looked over deposits. Then wrote to Millie Byington. Very cold looks like snow. Tuesday January 13- 1931 I was busy in forenoon. Went with Mrs Gay in the afternoon to The Legion Bld to the Relief Corp institution. After supper Mary came We met Hattie at The Englert for a picture show Weather rather cold. Read awhile before bed time. Wednesday January 14- 1931 Mrs Gay helped me wash my light coat. I wrote [Martie?] [Patten?] before dinner. Mary took me up town after dinner got me some shoes and did other errands. Weather very nice for winter time Thursday January 15- 1931 I cut out the lining for my coat in the AM and sewed some on it. Mary came for me at 3.15 to stay with Buddy while she went out till supper time William came and they brought me home at 8.30 I wrote Mrs Doyle and Ida before I went to bed Ott was here for dinner.